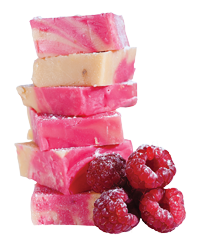 At Johnson's only the finest local ingredients go in to creating our toffee and fudge. Pure dairy butter and full cream condensed milk combined with traditional manufacturing techniques guarantees all our products have a distinctive taste and are highly regarded in the confectionery trade. Johnson's produce and supply a whole range of different flavours and bespoke requests to both wholesale and consumer markets to the same mouth watering standards. Backed by a customer service team who are friendly, reliable and efficient make the perfect recipe for success.